The Chinese mainland's summer box office for June to August reached a record high of 17.4 billion yuan ($2.5 billion) this year, a year-on-year increase of 7 percent. The three months span the summer vacation period for most schools in China, making it the most competitive and profitable period of the year for the industry since roughly 30 percent of mainland moviegoers are under the age of 25. More than 500 million tickets were sold during this period, a 6 percent increase from 2017's 470 million, according to a report released on Sunday by Chinese ticketing platform Maoyan. Additionally, the top 10 best performing films accounted for 73 percent of total box-office revenue for the summer, while 68 percent of the films shown during this period made less than 10 million yuan, according to the report. A total of 137 films debuted in the mainland over the past three months. This is the highest number of films for this period over the past three years, surpassing 2016's 114 and 2017's 136. 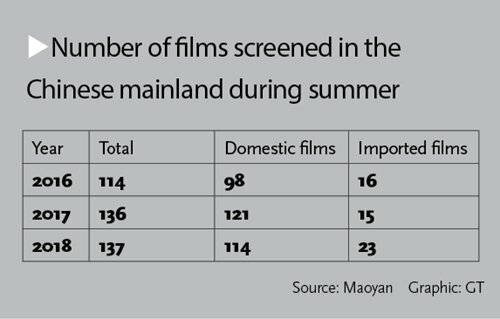 Among the 137 films, 23 were imported films - also a new high for recent years as July and August (and sometimes June) are normally protected months during which domestic films and Sino-foreign co-productions are mainly shown in theaters. Although the number of imported films rose this year, their market share dropped. According to the Maoyan report, imported films' 4.2 billion yuan in box office accounted for 24.4 percent of the total box-office take for the summer, a 5.3 percent decline from 2017 and an 8.1 percent drop in market share compared with that of 2016. Among the imported films that debuted during the period, the top two highest-grossers were Jurassic World: Fallen Kingdom with nearly 1.7 billion yuan and Marvel's Ant-Man and the Wasp, which earned 684 million yuan by August 31, the eighth day of its debut. On the other hand, imported animated films didn't make much of a splash in the market as the best performer, Pixar's The Incredibles 2, only took in 354 million yuan in China when it premiered in late June despite earning more than $600 million in its home market. When it comes to domestic films, their market share reached 66 percent by the end of July, according to data from the China Film Distribution and Screening Association. The number "is a figure to be proud of even when considering the international market," said China Film Association Secretary-General Rao Shuguang in an interview with Hong Kong-based newspaper Wen Wei Po on Sunday. The biggest winner goes to noir comedy Dying to Survive. Raking in a stunning 3 billion yuan over its 53-day run to become this year's third highest-grossing film, the Chinese film inspired by the true story of a leukemia patient illegally importing generic cancer drugs from India triggered waves of discussion about health care reform in China. Currently holding a 9/10 on Chinese review platform Douban, the film is the platform's highest-rated domestic film of the past decade based on more than 100,000 reviews. 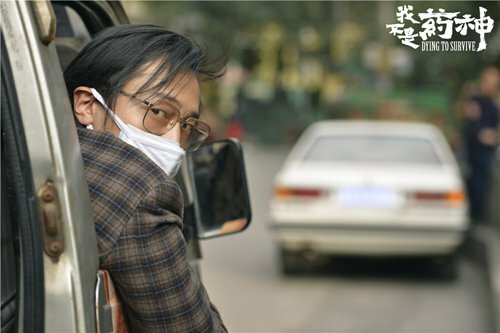 The second and the third highest-grossing domestic films were mainland comedy dramas Hello Mr. Billionaire and The Island with 2.5 billion and 1.3 billion yuan respectively. The three top performers' box office accounts for nearly 40 percent of total summer revenue. However, the rigorous competition during this period also forced some films to readjust their strategies. A total of 22 movies originally scheduled for the summer delayed their release dates or withdrew from cinemas after just a few days, according to China's National Business Daily. Among these films, the most dramatic move involved Asura. Abruptly pulled by its producers from cinemas due to "unfair market environment," the $113 million-budget film boasting "Hollywood-class visuals" only earned 48 million yuan during its short three-day run. The film currently holds a 3.1/10 rating on Douban based on 14,000 reviews. Another troubled domestic film was iApartment, which was originally scheduled to debut at midnight on August 10, but was delayed until later that afternoon. The film saw a 50 percent drop in box office for two consecutive days after a 300 million yuan debut. Supposedly a continuation of the 2009-14 hit Chinese mainland TV series of the same name, the film angered fans of the show by telling a tomb-robbing story that had little to do with the original TV series despite featuring many members of the original cast. Raking in a total of 554 million yuan, the film has a 2.8/10 rating on Douban, the lowest-rated domestic film of 2018 on the platform so far. 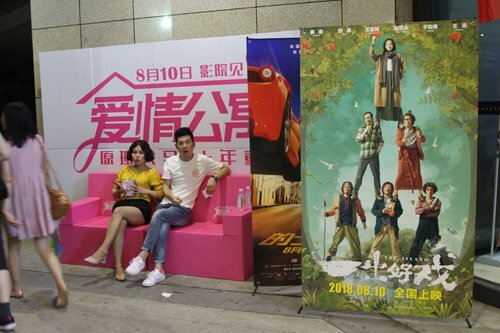 "The domestic film market is maturing and audiences' tastes are improving, as such many moviegoers have zero-tolerance for bad movies," Chinese film blogger Film Market Report wrote in an August article. "Many Chinese moviegoers care more about the quality and reputation of a movie, so fancy visuals or star power doesn't count as much as before," it added.